Wall Street Journal columnist Garry Kasparov states his opinion on the revolution in Iran. 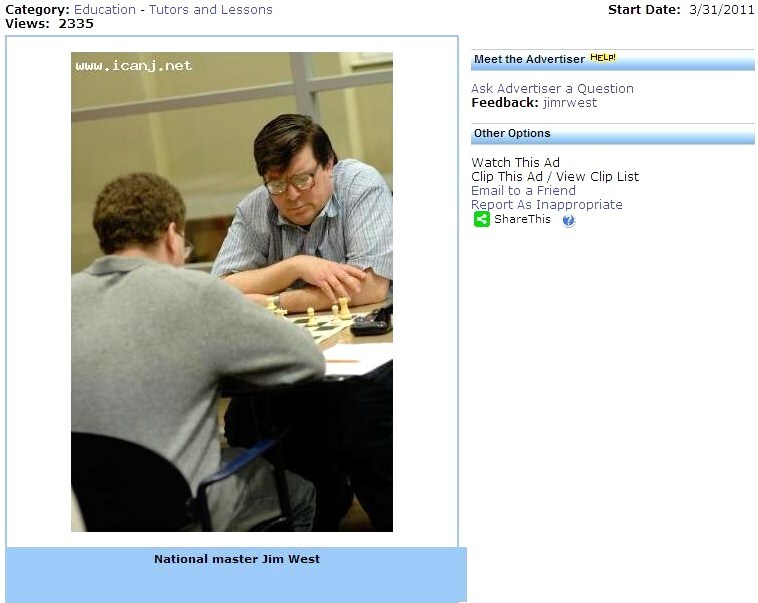 These photos were taken by me during yesterday's Grandmaster Challenge at the Marshall Chess Club. 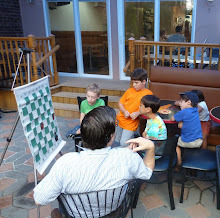 It was a Grand Prix event with a quick chess time control of game/25. 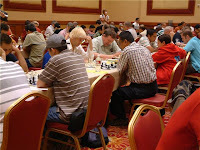 Players were not required to record their moves. I finished with an even score of 2-2-2. 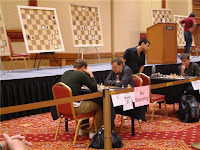 The sponsor of the Grandmaster Challenge tournaments is candidate master Yevgeni Margulis who can be seen presiding over the buffet table, which included black and red caviar as well as French Brie cheese. 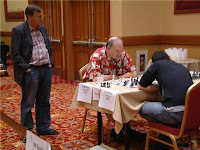 The tournament director was Andre Harding. 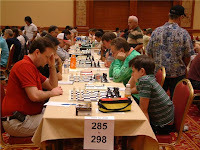 Among the participants were GM Sergey Kudrin, GM Jaan Ehlvest, WFM Iryna Zenyuk, FM Asa Hoffmann, and IM Jay Bonin, all of whom are pictured below. From memory, I have reproduced my victory in the final round. 15.g4 Ne7 16.bxa5 Rxa5 17.Ba3 Rfa8 18.Bd6 Qd8 19.Rxa5 Rxa5 20.Qg5 f6 21.exf6 Qxd6 22.Qxg7#. 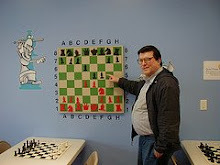 In yesterday's game/60 Swiss at the Marshall Chess Club, I finished with a score of 2-0-2. I won both games as White and drew both games as Black. Here are the draws. 50.Ra8 Rxh3 51.Rf8+ Kg4 52.Rg8+ Kxh4 53.Rh8+ Kg3 54.Rxh3+ Kxh3 55.Ke2 Kg3 56.Kxe3, draw. 35.bxc6 bxc6 36.Nb3 Rxa1 37.Rxa1 Rxa1+ 38.Nxa1 Ne6 39.Nb3 Kf8 40.Kf1 Ke7 41.Ke1 Kd8 42.Kd2 Kc7 43.h4 Ng7 44.g3 Nf5 45.Nc1, draw. 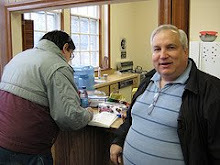 The 2009 New York International tournament at the Marshall Chess Club ended in a five-way tie for first place. U.S. Chess Scoop, Episode 2 from DIM mak films on Vimeo. 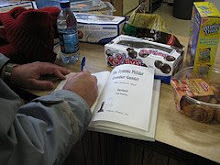 Saturdays: 10 consecutive Saturdays starting July 4, 09, 9:30 – 11:00am. $250 for all 10 classes, $30 per class [$200 club members or siblings, $25 per class]. Recommended for kids rated 800 +. Sundays: same as Saturdays, starting July 5, 09 but recommended for beginners. Workshops: 3 weeks of intensive instructions on all aspects of the game, openings, middle game and endings. Monday to Friday, 9:00am – 12:00pm starting July 6, 09. Recommended for players rated 1200 +. Discount: $150 for club members, siblings or more than one week, discounts can’t be combined. Tuesday Nights: adult members’ free lectures [$10 non-members]. 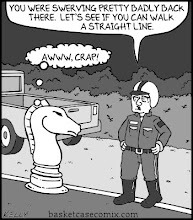 Sponsored by the Marshall Chess Foundation. 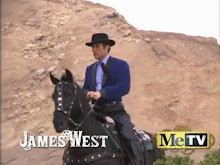 In this video, baritone Josh Groban is interviewed. Groban appears as the Russian champion Anatoly in the musical Chess. At his Contre Gambit Philidor website, Frederic Fournier gives an over-the-board rating of 1932 for Domingos Savio Perego who is pictured above. Last Wednesday, Garry Kasparov staged a protest at the trial of Mikhail Khodorkovsky. On Sunday June 14th, Ziping Liu won quad six at Westfield with a score of 1-0-2. Here is his draw from the second round. 24.Re1 Nxc3 25.bxc3 Kh7 26.Rge2 b6 27.d5 c5 28.Rf1 Qe5 29.Na3, and drawn in ? moves. These pictures were taken by me at yesterday's quads in Hamilton. 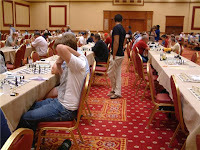 The last three pix show players awaiting the start of the tournament. 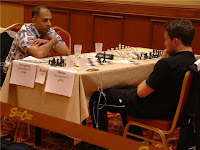 National masters Dragan Milovanovic and Boris Privman drew their first round game in quad one. 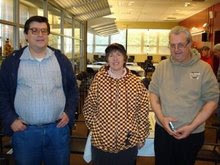 Bloggers Diamondback and Atomic Patzer were in attendance. Tournament director Ed Sytnik makes the pairings for round one. Today, in quad one at Hamilton, I drew this game. 29.Nb6 Bf8 30.Nbc4 Ke6 31.Ra1 Rc6 32.Ra5 Bc5 33.Kd2 Bd4 34.Ra4 Bxc4 35.bxc4 Bxe3+ 36.Kxe3 Rxc4 37.b3 Rd4 38.g4 Rd3+ 39.Kxe4 Rd4+ 40.Kf3 Rd3+ 41.Ke4 Rd4+ 42.Kf3 Rd3+, draw. 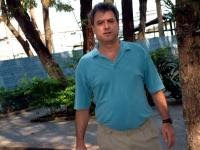 Domingos Savio Perego of Brazil has e-mailed the following game. which he won with the PCG as Black. 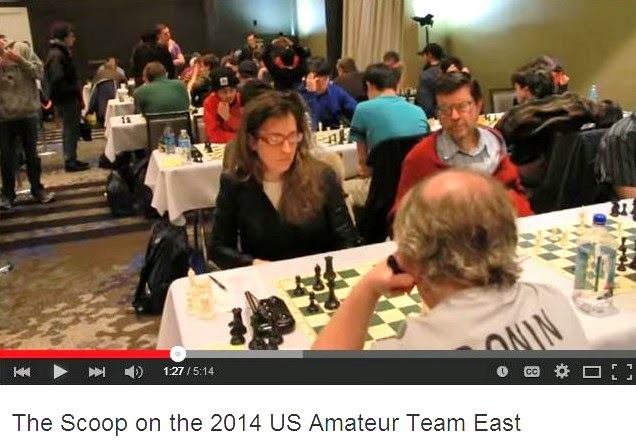 It was played in a postal tournament, held at Chess.com, with a time control of 1 day per game. Presumably Perego has given postal ratings since he is FIDE unrated, although he has scored above 50% in seven FIDE rated games. 54.Rxb5+ Kxb5 55.Kh4 Nf6 56.Kg5 Nd5 57.Kxh5 a4 58.Kg5 Kb4 59.Rg1 a3 60.Rg4 Nc3 61.Kf6 a2 62.Rg1 Bb1, White resigns. If you missed last night's airing of the musical Chess on PBS, it will be shown again in the New York area on Channel 13, tomorrow from 1am to 3:30am. 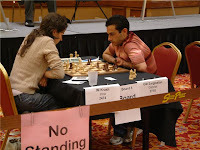 Near the start of the tournament, I took these pictures at the New York June Game/50 Open on Saturday. 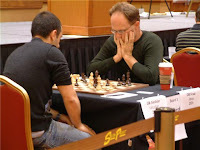 Henry Sobo lost to grandmaster Giorgi Kacheishvili in round one. 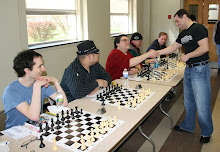 Among the other winners in the first round were GM Michael Rohde and IM Jay Bonin. FM Asa Hoffmann, with back to camera, walks toward his board. Here is a shot of the tournament room at the New Yorker Hotel, from the rear wall. Here is a video of Bobby Fischer's visit to the Philippines in 1973. 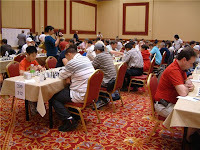 The 2009 National Open was held at the South Point Hotel in Las Vegas, on the first weekend in June. 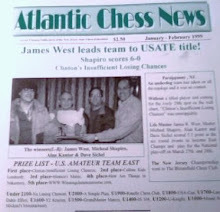 Atlantic Chess News editor Steve Ferrero took these photos. 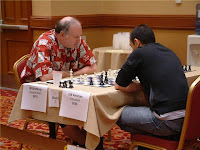 Yesterday I played in the New York June Game/50 Open at the New Yorker Hotel, finishing with a score of 2-2-1. These are my two wins. 30.Rc7+ Ke6 31.Re1+ Kd6 32.Rxf7 Rxa2 33.Rxb7 Ra3 34.Ke3 g5 35.fxg5 Ke5 36.Kf3+ Kf5 37.g4+ Kxg5 38.Re5+ Kf6 39.Rxd5 Rh3+ 40.Ke4 Ra4+ 41.Rd4 Ra6 42.Rdd7 Rg3 43.Kf4 Rg1 44.Rf7+ Ke6 45.Rbe7+ Kd5 46.Rd7+ Ke6 47.Rfe7+ Kf6 48.g5+ Kg6 49.Rg7+, Black resigns. 30.d5 f4 31.Qxf4 Rf8 32.Qg3 exd5 33.Re7 Rf7 34.Qb8+ Kg7 35.Qe5+ Kg8 36.Rxd7, Black resigns.